If there were ever a time of year for baking the most over-the-top comfort foods, it would definitely have to be the December holidays. It's as if it were a biological requirement that we consume all the foods that pack on the pounds with impunity (and there's probably some truth to that, the holidays timed when the weather is getting colder and those extra layers of fat keep us cozy... or at least that is my excuse). The idea behind these Peppermint Candy Cane loaded Buns of epic proportion was simple. I love a good Cinnamon Bun (or a bad one... I'm not picky when it comes to carbs), and I love Chocolate and Candy Canes. So why not swap out that traditional Cinnamon & Sugar filling for something more seasonal? Baked as a massive roll, these Chocolate Candy Cane Breakfast Buns are made for sharing (or for your dear, morbidly obese Aunt Doris who keeps insisting it's a thyroid problem). The base dough for this recipe is leavened with Yeast. If you've never worked with Yeast before, don't worry. This dough is very forgiving (also try out this easy recipe for Sweet Dinner Rolls). Just be aware of the additional prep time required to proof the dough several times (i.e. let it rise). The Bun Dough begins by mixing a Sponge, which is a type of preferment. The Sponge is made from Flour, Water and Yeast. For this recipe, the ingredients mix to a very thick consistency (you may find it is easiest to use your hands) and set aside in a covered bowl for about 15 minutes. 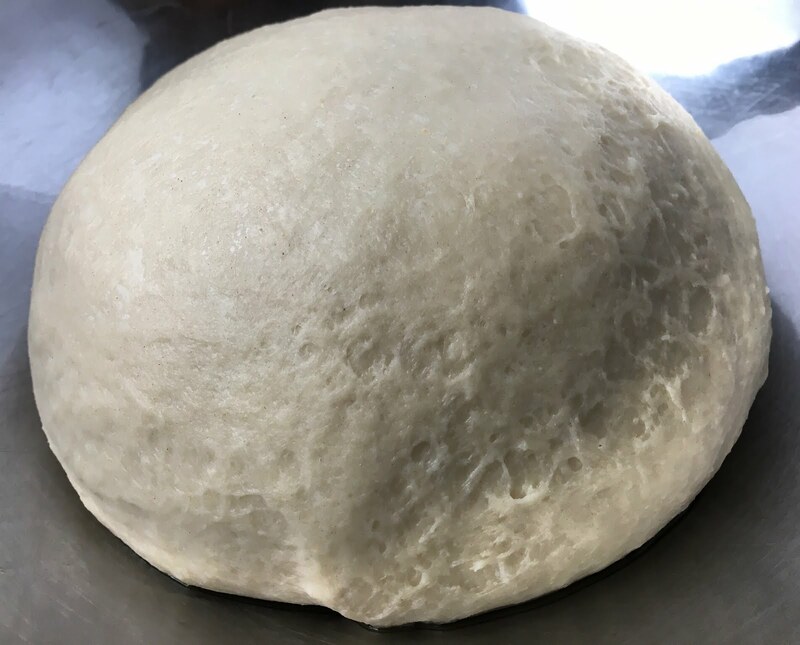 As the Sponge rests, the Flour hydrates and the Yeast activates, beginning the fermentation process that provides both flavor and leavening to the final Bun Dough. Once the Sponge has rested and begins to rise, it is mixed with all of the other Bun Dough ingredients. Transfer the rested Sponge to the bowl of an electric mixer fitted with a dough hook, then add the wet ingredients followed by the dry ingredients. Begin to mix the Bun Dough on the lowest mixer speed until the Bun Dough begins to come together. If you start mixing on a high speed, you can rest assured that Flour will fly all over your kitchen. Once the Bun Dough has started to come together, increase the mixer speed to medium and knead the Bun Dough until the gluten structure is well developed - approximately 10 minutes. The Bun Dough should be soft, smooth and elastic - similar to a Brioche. The Bun Dough should be just slightly sticky to touch. The gluten structure has been well developed when you can gently stretch a piece of the Bun Dough between your fingers and it does not tear but rather forms a "window" or thin pane. Once the Bun Dough is mixed and the gluten structure is well developed, it is time for the bulk proof. Use a bowl scraper to remove the Bun Dough from the mixer and form it into a ball. Transfer the Bun Dough to a well-oiled bowl. Cover the bowl with plastic wrap and set it aside in a warm place (approximately 75 degrees Fahrenheit / 24 degrees Celsius) to proof for 20-25 minutes. The proofing Bun Dough will not double in volume, but it should have noticeably increased in size. If you poke the Bun Dough with your finger, it should make an indentation that slowly refills. If the Bun Dough bounces back immediately, let it proof longer. If the indentation does not refill, the Bun Dough may be over-proofed and you should proceed immediately. 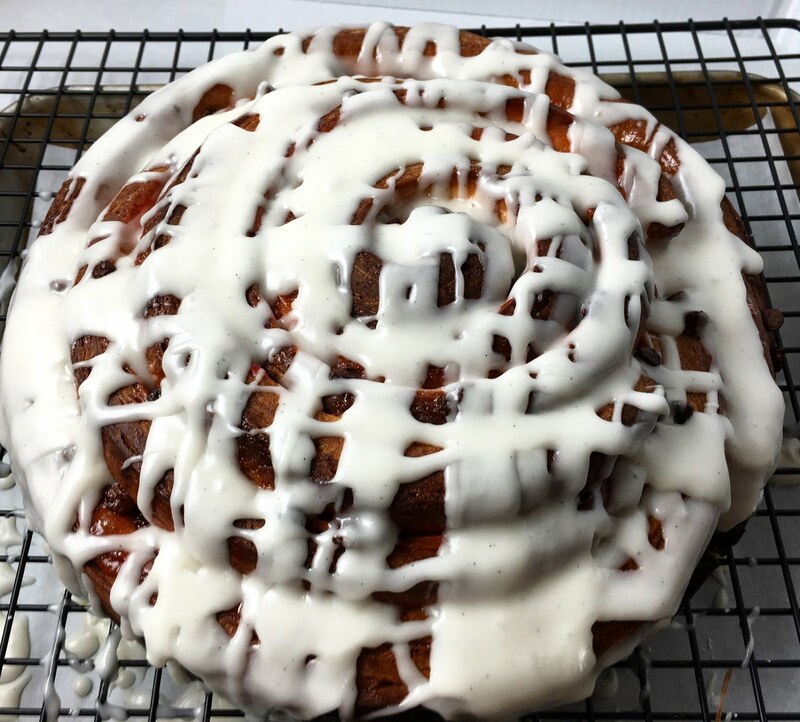 What makes these Breakfast Buns truly unique (and so much more fun than a plain old Cinnamon Roll) is the filling. Fortunately, it couldn't be simpler. 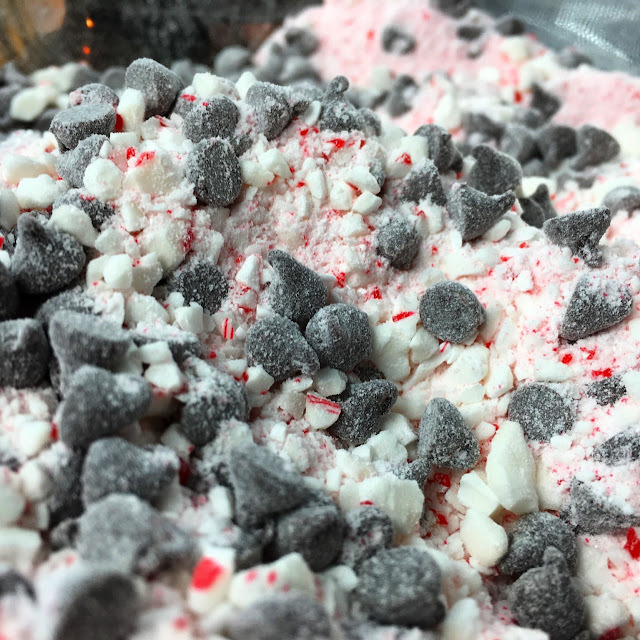 As the Bun Dough bulk proofs, place the Candy Canes in a food processor and grind them until they form a rough powder. You want the consistency to resemble a fine sugar with no large chunks. Next, finely chop the Dark Chocolate. You can also use miniature Chocolate Chips. Combine the crushed Candy Canes and chopped Dark Chocolate in a bowl and set it aside. As a note, you will need to save a few tablespoons of the Chocolate & Candy Cane Filling to sprinkle as a final garnish, so do so now. Melt the Butter and set it aside. By the time you are done making the Chocolate & Candy Cane Filling, the Bun Dough will likely have completed its initial rise. 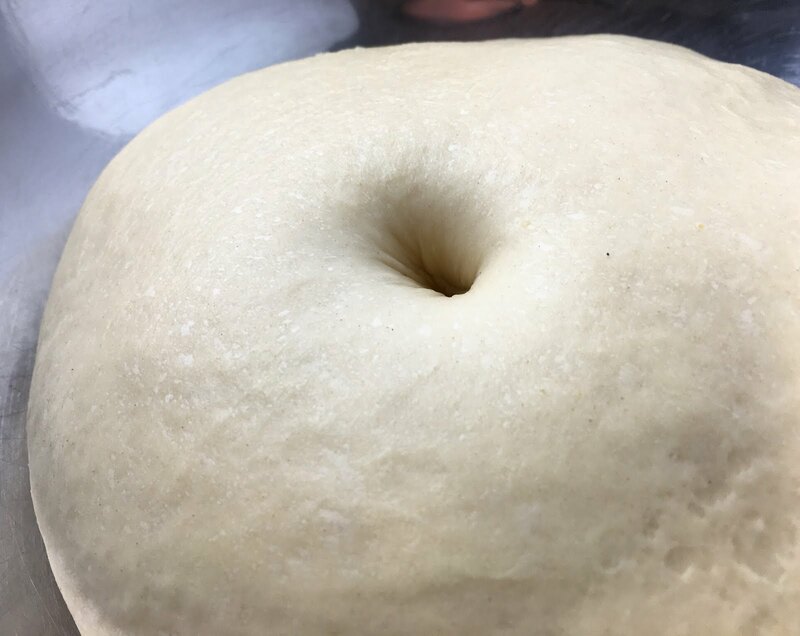 Turn the Bun Dough over in the bowl and gently fold the Bun Dough in over itself, gently grabbing the outer edge and folding it up into the center. This process of turning, folding and de-gasing the Bun Dough helps to further develop the gluten structure, redistributes the Yeast and its food source, and releases carbon dioxide. Cover the bowl with plastic wrap and set it aside to proof for an additional 20-25 minutes. With the Bun Dough proofing, now would be a good time to make sure everything else is ready for forming and baking the Chocolate Candy Cane Breakfast Buns. Prepare two 8"/9" pans with butter or non-stick spray. And so you're not caught with a cold oven, preheat the oven to 375 degrees Fahrenheit (191 degrees Celsius). Now the fun begins... forming the Buns. Gently turn the Bun Dough out onto a lightly floured surface. The Bun Dough should feel soft and should be very easy to handle. If should not seem overly elastic or sticky to touch. 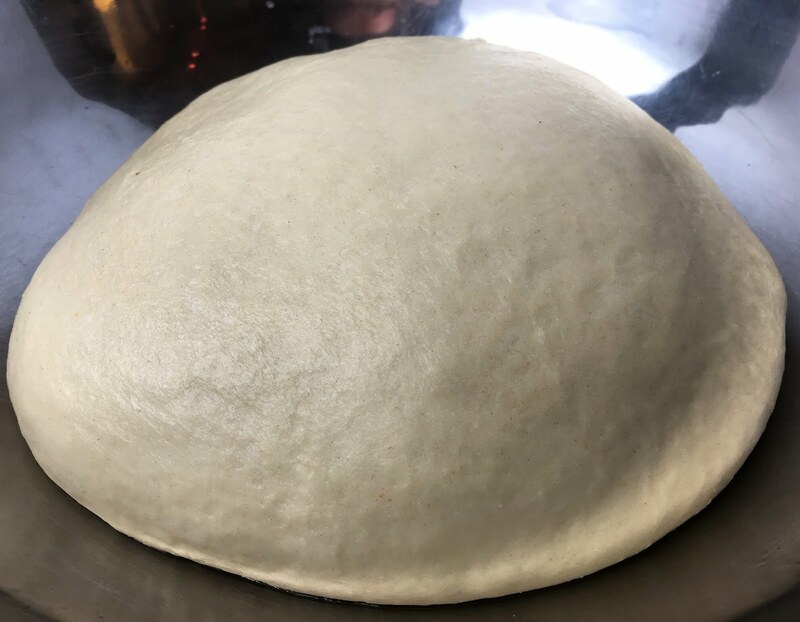 Roll the Bun Dough into a rectangle measuring 12" wide and as long as it extends so that it is approximately 1/4" thick (approximately 20"). Try not to overwork the Bun Dough when rolling. This will begin to develop too much gluten and will make the Bun Dough elastic like a rubber band. 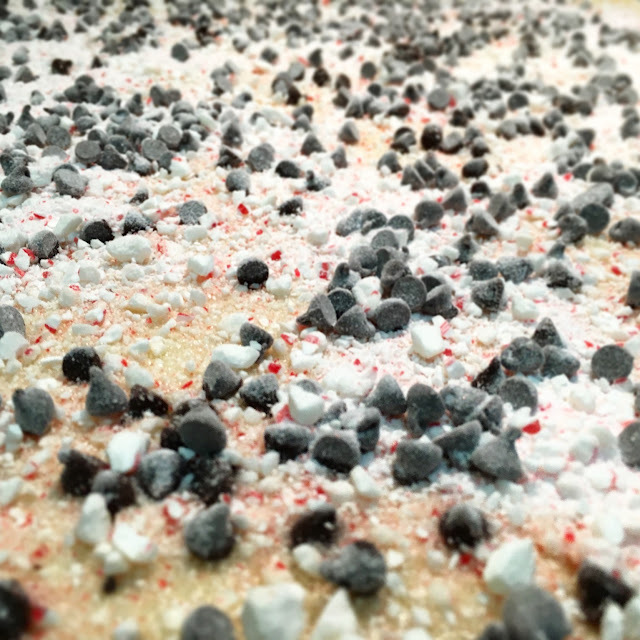 With the Bun Dough rolled into a rectangle, it's time for the Chocolate & Candy Cane Filling! Liberally brush the Bun Dough with the melted Butter (you should save some for brushing the tops of the formed Chocolate Candy Cane Breakfast Buns). And if you haven't done so already, set aside a couple of tablespoons of the Chocolate & Candy Cane Filling to use as a topping for the baked Chocolate Candy Cane Breakfast Buns. Evenly sprinkle the remaining Chocolate & Candy Cane Filling onto the rolled and buttered Bun Dough. Using a sharp knife or pastry cutter, cut the sheet of Bun Dough into six strips approximately 2" wide. Each Chocolate Candy Cane Breakfast Bun is made using three of the strips of Bun Dough. Begin by rolling one of the strips into a spiral. When you have rolled up the entire strip, align the end of the spiral with the beginning of the second strip of Bun Dough and continue rolling. Repeat the process with the third strip of Bun Dough. Place the large spiral of Bun Dough in the center of the prepared pan. 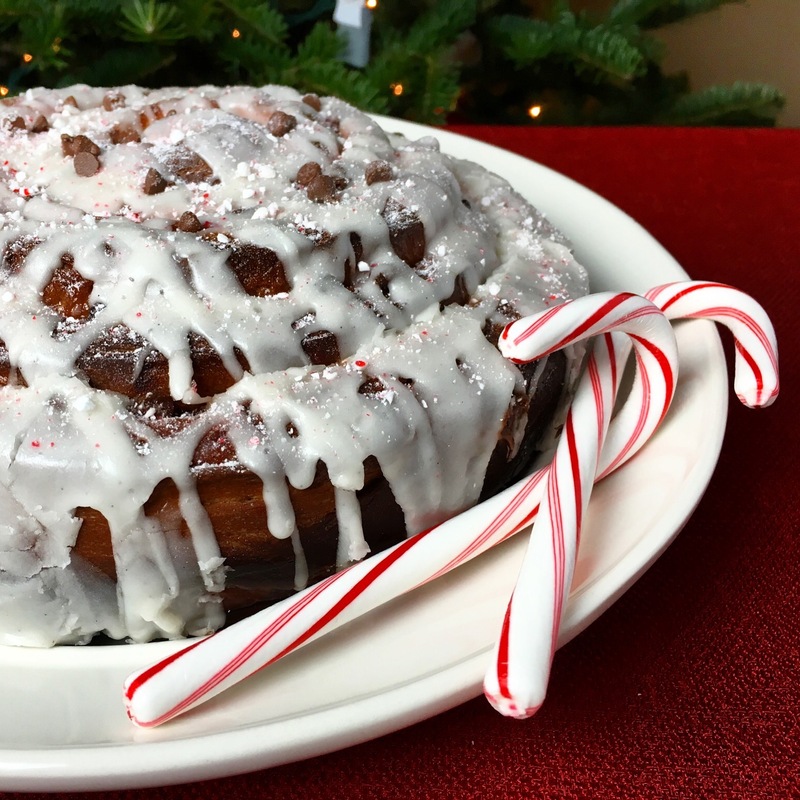 You will notice that the formed Chocolate Candy Cane Breakfast Bun is much smaller than an 8"/9" pan. It will expand significantly during the final proof and even more dramatically once it hits the oven. 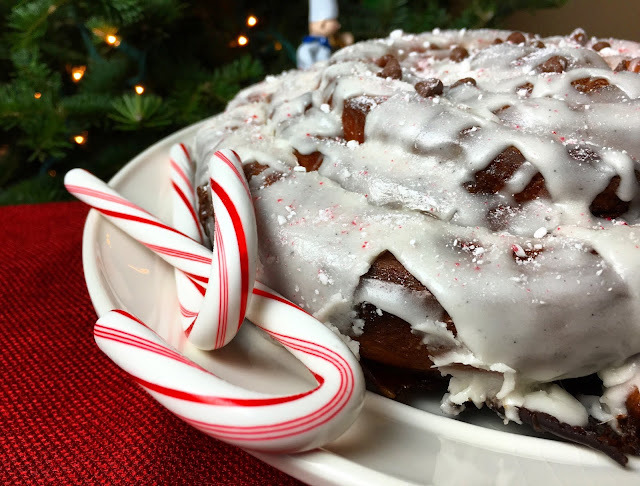 To keep the Chocolate Candy Cane Breakfast Bun from "unwinding", tuck the loose piece of Bun Dough at the end of the spiral under the formed Chocolate Candy Cane Breakfast Bun. Repeat the rolling process with the remaining three strips of Bun Dough to form the second Chocolate Candy Cane Breakfast Bun. Brush both of the Chocolate Candy Cane Breakfast Buns with the remaining melted butter and loosely cover the pans with plastic wrap. If the plastic wrap is too tight, it will constrain the final proof. Set the pans aside for the final proof - approximately 20-25 minutes. Bake the Chocolate Candy Cane Breakfast Buns at 375 degrees Fahrenheit (191 degrees Celsius) for approximately 30-35 minutes or until they reach an internal temperature of 190 degrees Fahrenheit (87 degrees Fahrenheit). For a large, thicker bread product like this, judging the baking time based on the internal temperature is best. It ensures that the Bun Dough is baked all the way through, even in the very center. While the Chocolate Candy Cane Breakfast Buns are baking, make the Vanilla Glaze, what some would argue is the best part of a Cinnamon Bun (personally, I like all the parts)! Combine the Powdered Sugar and soft Butter in a medium bowl. While stirring gently, slowly add the Milk until the desired consistency is achieved. You may need more or less than the 60g of Milk called for in the recipe. The Glaze should not be too runny. When the desired consistency is achieved, cover the bowl and set it aside. While the Chocolate Candy Cane Breakfast Buns are still warm, remove them from the pans and place them on a wire cooling rack over a sheet tray or piece of parchment paper. Removing the Chocolate Candy Cane Breakfast Buns from the pans while they are warm is very important. As they cool, any filling that has oozed to the bottom of the pan will begin to harden making it much harder to unmold. As for placing the cooling rack over a sheet tray or piece of parchment, this is simply a matter of easy clean up! Generously drizzle the Vanilla Glaze onto the surface of the Chocolate Candy Cane Breakfast Buns. Lightly sprinkle the tops with the remaining, reserved Chocolate & Candy Cane Filling. The Chocolate Candy Cane Breakfast Buns will keep well for several days stored at room temperature in an airtight container. Do not store the Chocolate Candy Cane Breakfast Buns in the refrigerator. 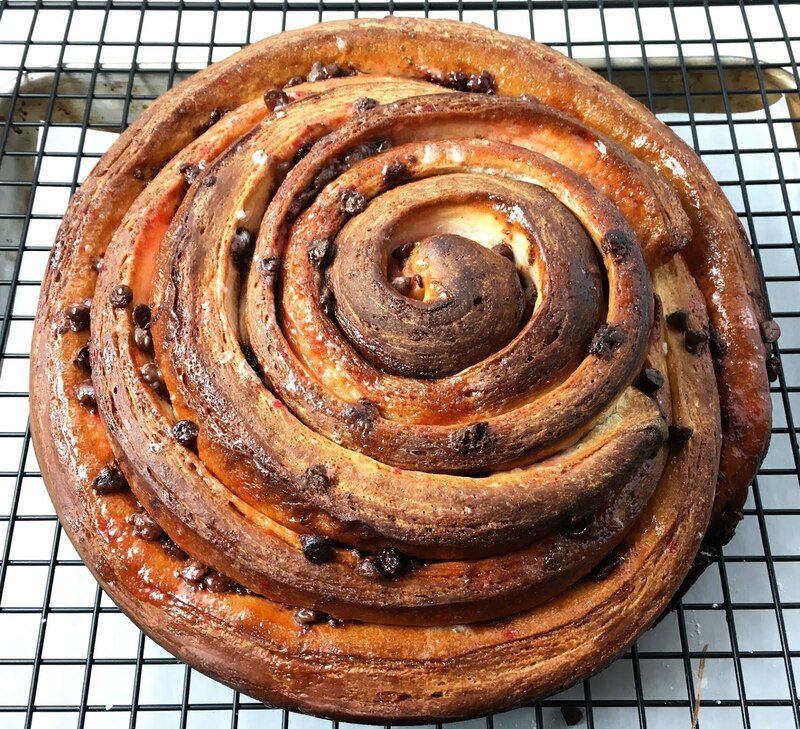 The base dough in the recipe has been adapted from the recipe for Orange Cinnamon Swirl Bread, part of the Professional Pastry Arts Program at the International Culinary Center. * If you do not have Fresh Yeast, you can use either Active Dry Yeast or Instant Yeast. For Active Dry Yeast, use 50% of the recipe weight (20g). For Instant Yeast, use 40% of the recipe weight (16g). 1. Make the Sponge: In a small bowl, combine the Yeast with the lukewarm Water (approximately 90 degrees Fahrenheit / 32 degrees Celsius). Stir in the Bread Flour and mix the ingredients until they are well combined. The consistency will be very thick so you may find it easiest to use your hands. Cover the bowl with plastic wrap and set it aside for approximately 15 minutes. 2. Mix the Bun Dough: Transfer the rested Sponge to the bowl of an electric mixer fitted with a dough hook. Add the Milk, Eggs and melted Butter to the Sponge. Next add the Bread Flour, Sugar, Milk Powder and Salt on top of the wet ingredients. Begin to mix the Bun Dough on the lowest mixer speed until the Bun Dough begins to come together. Increase the mixer speed to medium and knead the Bun Dough until the gluten structure is well developed - approximately 10 minutes. The Bun Dough should be soft, smooth and elastic - similar to a Brioche. Chef's Note: The Bun Dough should be just slightly sticky to touch. The gluten structure has been well developed when you can gently stretch a piece of the Bun Dough between your fingers and it does not tear but rather forms a "window" or thin pane. 3. Bulk Proof the Bun Dough: Use a bowl scraper to remove the Bun Dough from the mixer and form it into a ball. Transfer the Bun Dough to a well-oiled bowl. Cover the bowl with plastic wrap and set it aside in a warm place (approximately 75 degrees Fahrenheit / 24 degrees Celsius) to proof for 20-25 minutes. Chef's Note: The proofing Bun Dough will not double in volume, but it should have noticeably increased in size. If you poke the Bun Dough with your finger, it should make an indentation that slowly fills in. If the Bun Dough bounces back immediately, let it proof longer. If the indentation does not fill in, the Bun Dough may be over-proofed and you should proceed immediately. 4. 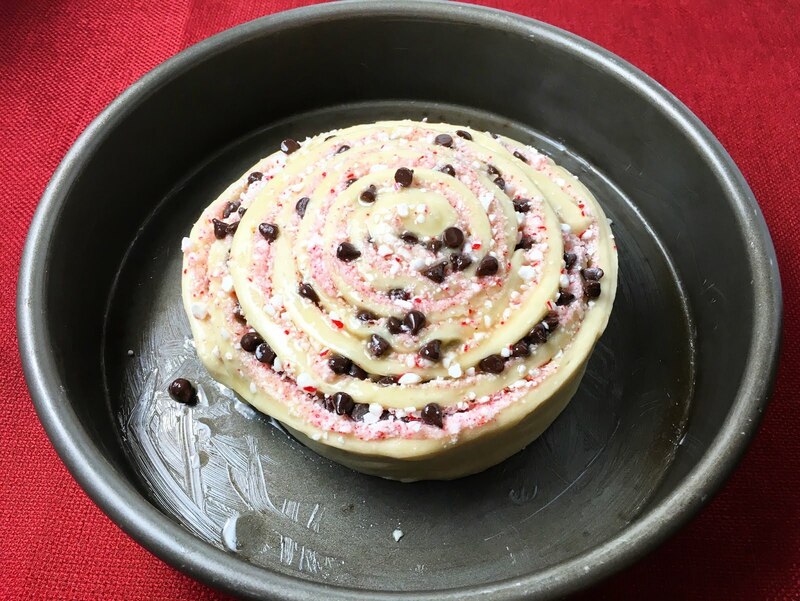 Make the Chocolate & Candy Cane Filling: As the Bun Dough bulk proofs, place the Candy Canes in a food processor and grind them until they form a rough powder. Finely chop the Dark Chocolate. Combine the crushed Candy Canes and chopped Dark Chocolate in a bowl and set it aside. Melt the Butter and set it aside. 5. 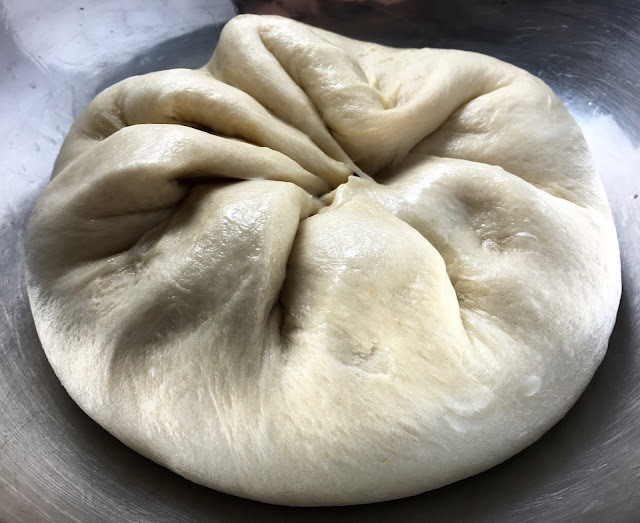 Turn/Fold/De-Gas the Bun Dough: Turn the Bun Dough over in the bowl and gently fold the Bun Dough in over itself, gently grabbing the Bun Dough from the outer edge and folding it up into the center. Cover the bowl with plastic wrap and set it aside to proof for an additional 20-25 minutes. 6. As the Bun Dough continues to proof, prepare two 8"/9" pans with butter or non-stick spray. Preheat the oven to 375 degrees Fahrenheit (191 degrees Celsius). 7. Form the Buns: Gently turn the Bun Dough out onto a lightly floured surface. 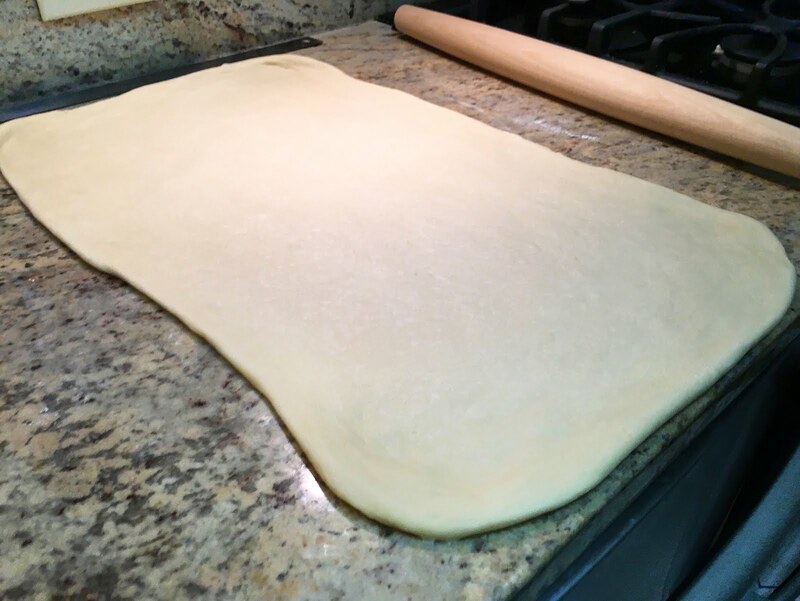 Roll the Bun Dough into a rectangle measuring 12" wide and as long as it extends so that it is approximately 1/4" thick (approximately 20"). Liberally brush the Bun Dough with the melted Butter (you will have some left over for brushing the tops of the formed Chocolate Candy Cane Breakfast Buns). Set aside a couple of tablespoons for the Chocolate & Candy Cane Filling to use as a topping for the baked Candy Cane Breakfast Buns. Evenly sprinkle the remaining Chocolate & Candy Cane Filling onto the rolled and buttered Bun Dough. Using a sharp knife or pastry cutter, cut the sheet of Bun Dough into six strips approximately 2" wide. 8. Place the large spiral of Bun Dough in the center of the prepared pan. 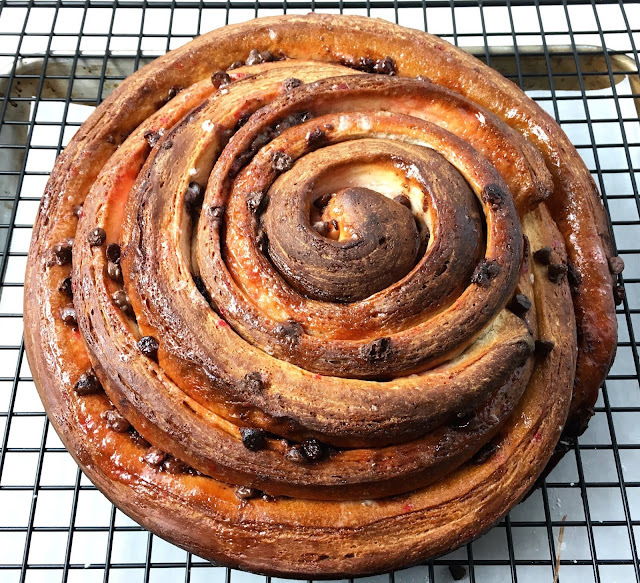 Tuck the loose end of Bun Dough at the end of the spiral under the formed Chocolate Candy Cane Breakfast Bun to help it holds its shape. Repeat the process with the remaining three strips of Bun Dough to form the second Chocolate Candy Cane Breakfast Bun. Brush both of the Chocolate Candy Cane Breakfast Buns with the remaining melted butter and loosely cover the pans with plastic wrap. Set the pans aside for the final proof - approximately 20-25 minutes. 9. Bake the Chocolate Candy Cane Breakfast Buns at 375 degrees Fahrenheit (191 degrees Celsius) for approximately 30-35 minutes or until they reach an internal temperature of 190 degrees Fahrenheit (87 degrees Fahrenheit). The Chocolate Candy Cane Breakfast Buns will increases in size so as to fully fill the 8"/9" pans. Set the Chocolate Candy Cane Breakfast Buns aside to cool for 5-10 minutes. 10. Prepare Vanilla Glaze: While the Chocolate Candy Cane Breakfast Buns are baking, combine the Powdered Sugar and soft Butter in a medium bowl. While stirring gently, slowly add the Milk until the desired consistency is achieved. You may need more or less than the 60g of Milk. The Glaze should not be too runny. When the desired consistency is achieved, cover the bowl and set it aside. 11. Glaze the Chocolate Candy Cane Breakfast Buns: While the Chocolate Candy Cane Breakfast Buns are still warm, remove them from the pans and place them on a wire cooling rack over a sheet tray or piece of parchment paper. Generously drizzle the Vanilla Glaze onto the surface of the Chocolate Candy Cane Breakfast Buns. Lightly sprinkle the tops with the remaining, reserved Chocolate & Candy Cane Filling. - The Chocolate Candy Cane Breakfast Bun will keep well for several days stored at room temperature in an airtight container. Do not store the Chocolate Candy Cane Breakfast Bun in the refrigerator.